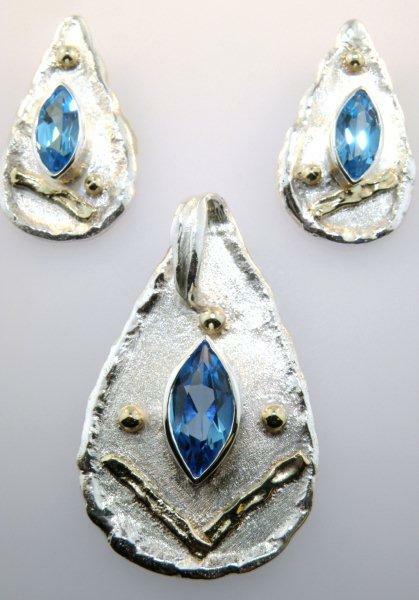 The pendant measures about 1 and 5/8 inches in length and is set with a 14 x 7mm Marquise Cut Swiss Blue Topaz. The bail on the pendant will accommodate a 3mm wide omega chain. 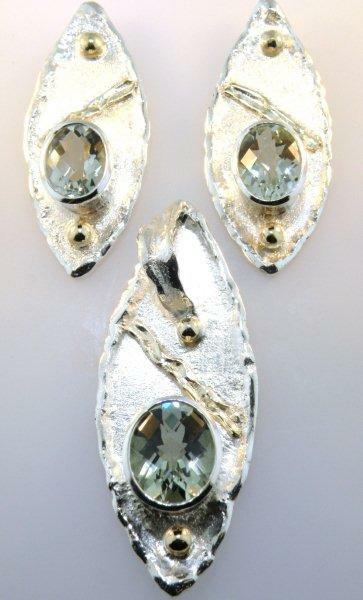 The matching earrings measure about 1 inch in length. Each is set with a 10 x 5mm Marquise Cut Swiss Blue Topaz. 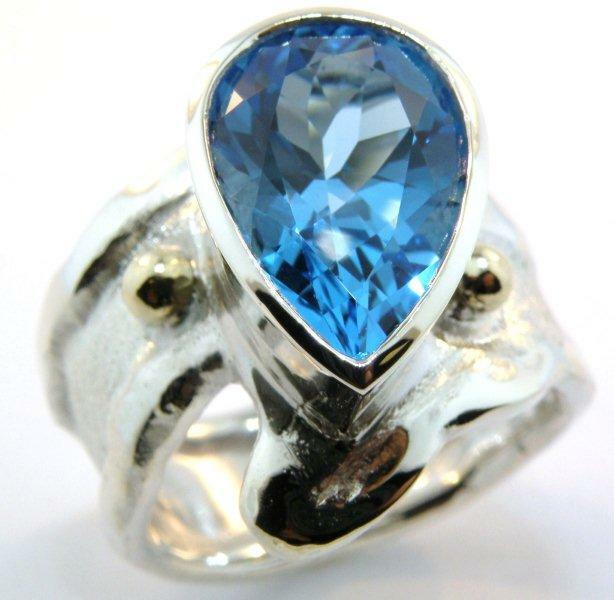 This asymmetrical bypass style ring features a 14 x 9 Pear Shape Swiss Blue Topaz. At its widest point the ring is about 27 mm wide with the band tapering to about 9 mm. Size 7. The pendant measures about 2 inches in length and is set with a 14 x 12 mm Oval Checkerboard Cut Green Quartz. The pendant bail will accommodate up to a 4 mm wide omega chain. 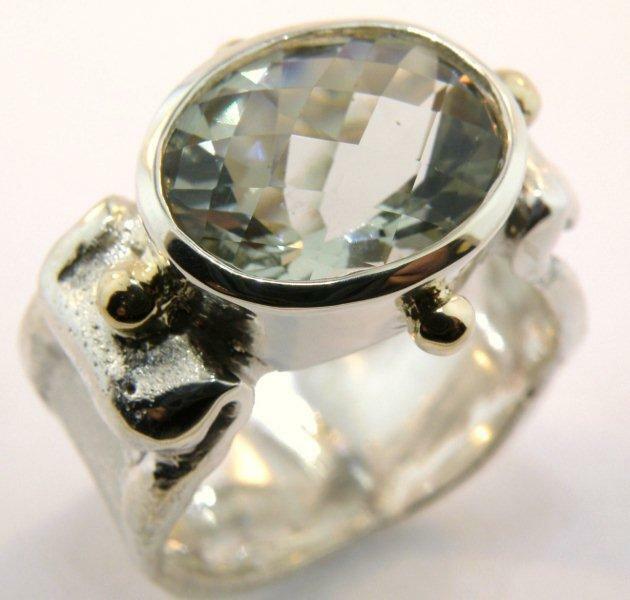 This ring features a14 x 12mm Oval Checkerboard Cut Green Quartz set horizontally across the finger. The band is approximately 10 mm wide. Size 7. The bracelet is comprised of 7 links each measuring approximately 5/8 inch wide by ¾ inch long. 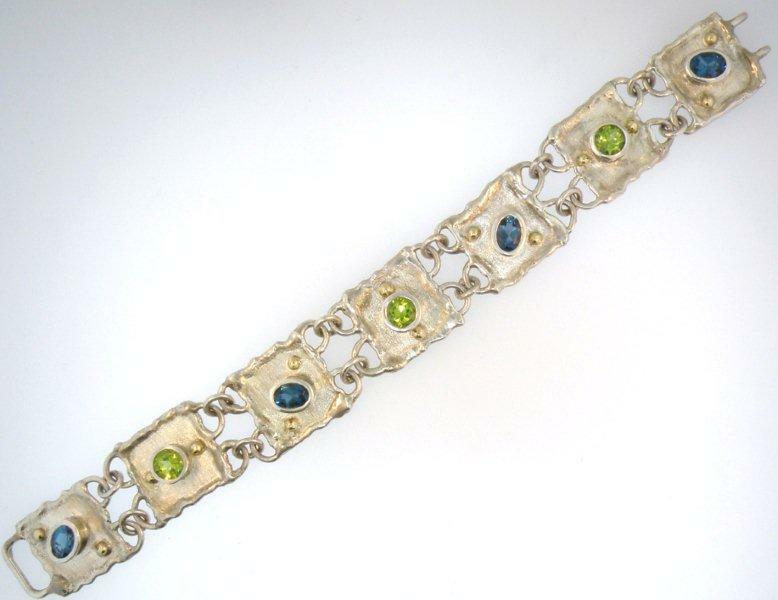 It is approximately 7 inches long and features (4) 7mm x 5mm London Blue Topaz stones and (3) 6 mm Round Peridots. The ring measures about 15mm wide at the widest part of the band, tapering to about 10 mm on the underside. 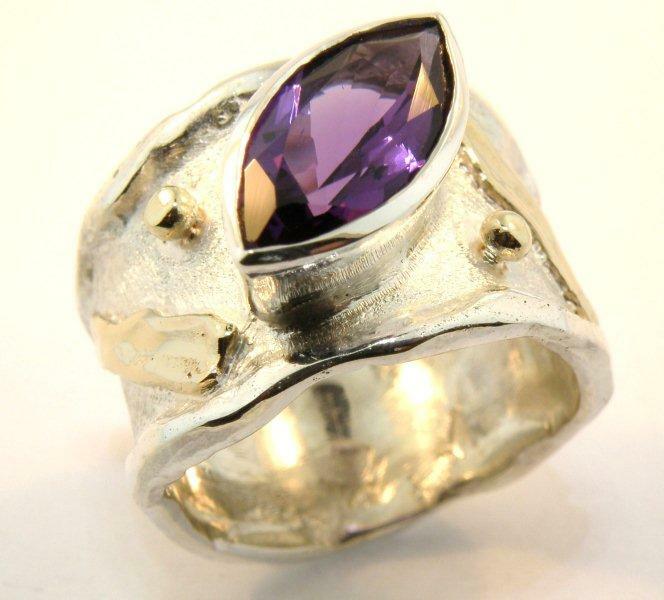 It is set with a 14 x 7mm Marquise Cut Amethyst. Size 7½. The bracelet is comprised of 7 links each measuring approximately 1 inch by 1 inch. 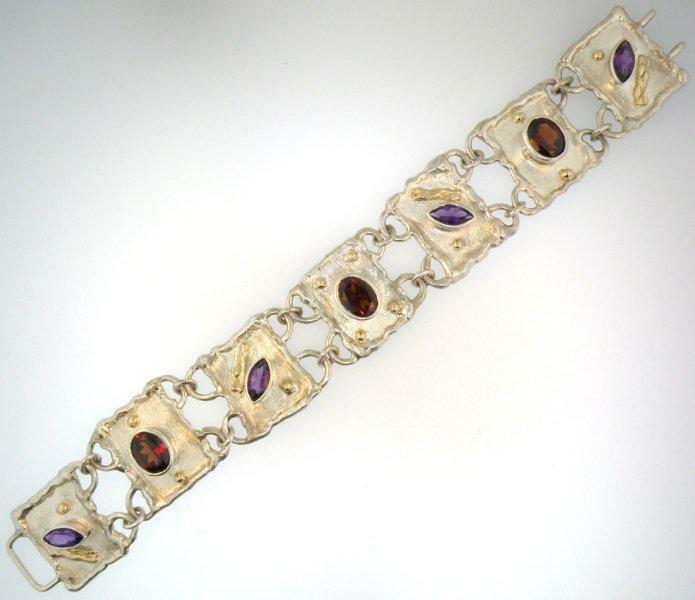 It is approximately 7 ¾ inches long and features (4) 10x5mm Marquise Cut Amethysts and (3) 10x8mm Oval Cut Mozambique Garnets. 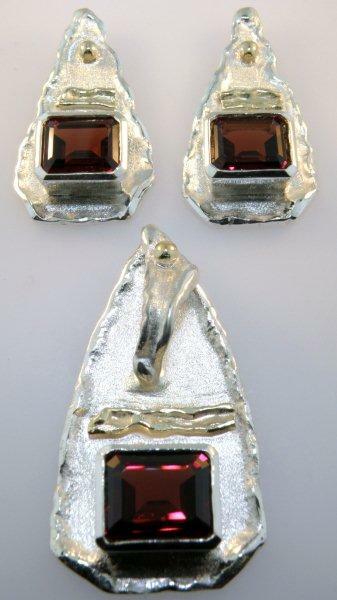 The Pendant measures about 1 and ¾ inches in length and is set with a 14 x 12mm Emerald Cut Mozambique Garnet. The bail on the pendant will accommodate up to a 4 mm wide omega chain. 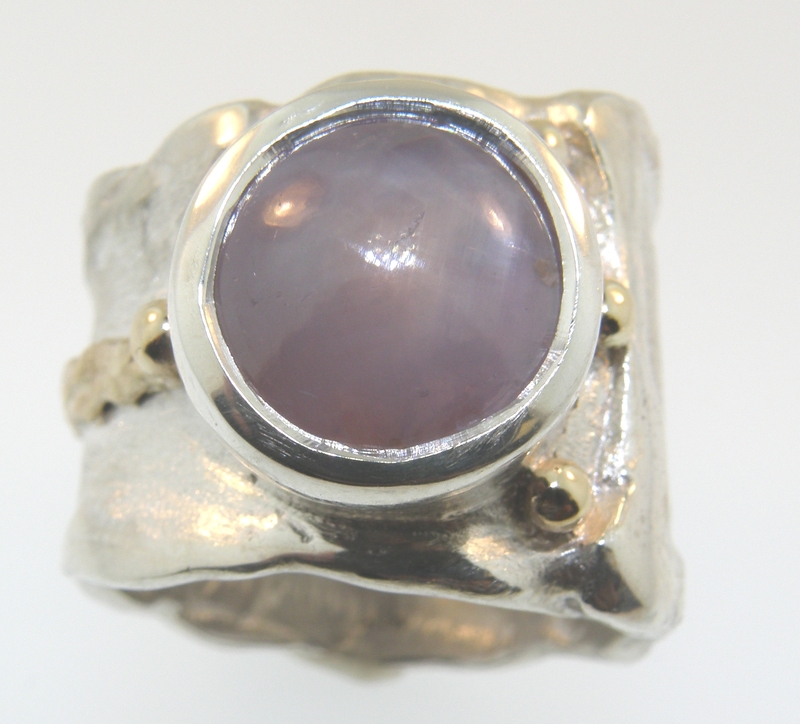 This ring features a round cabochon lavender star sapphire set in sterling silver with 14 karat yellow gold accents. This type of sapphire is very difficult to find. It weighs 4 carats. The ring is a size 8 and is 16mm wide at the top, tapering to 14 mm wide at the shank. 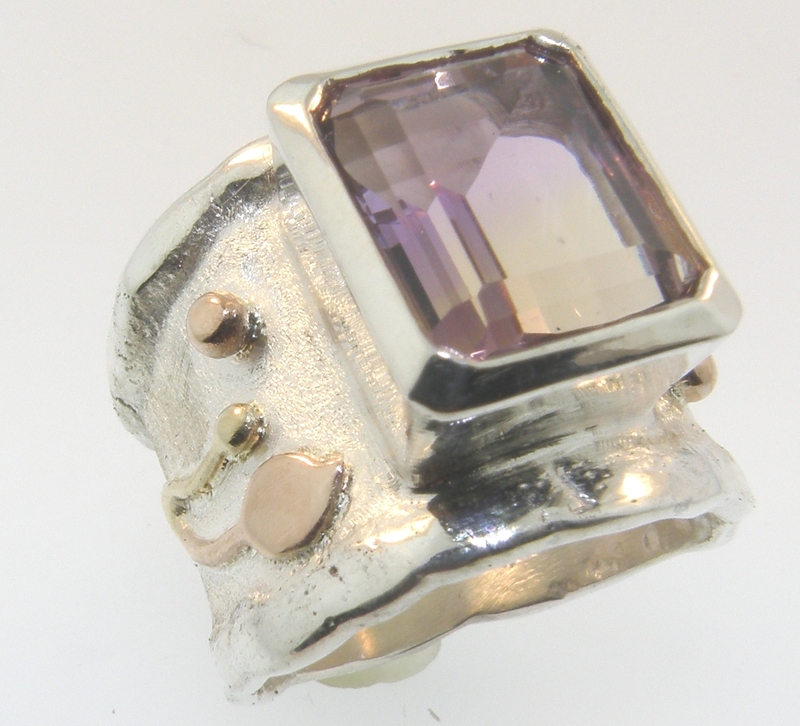 A 5 carat emerald cut ametrine is the centerpiece of this sterling and 14 karat yellow and rose gold ring. 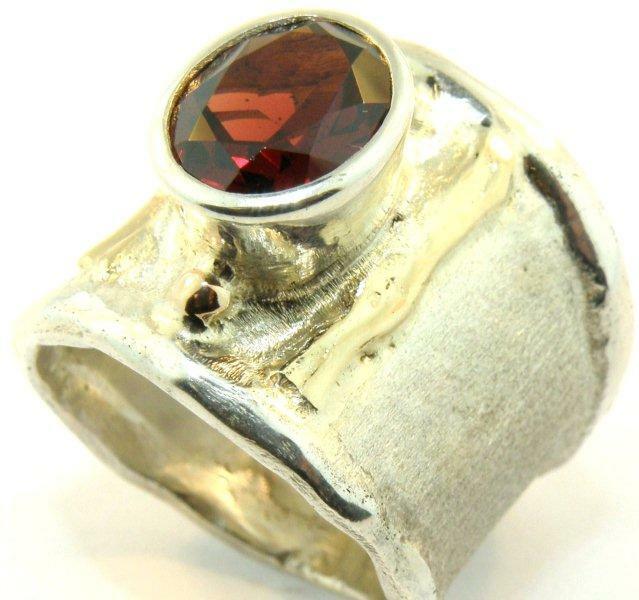 The ring is a size 8 and quite wide, measuring 18 mm at the top and tapeirng to 10 mm on the shank. 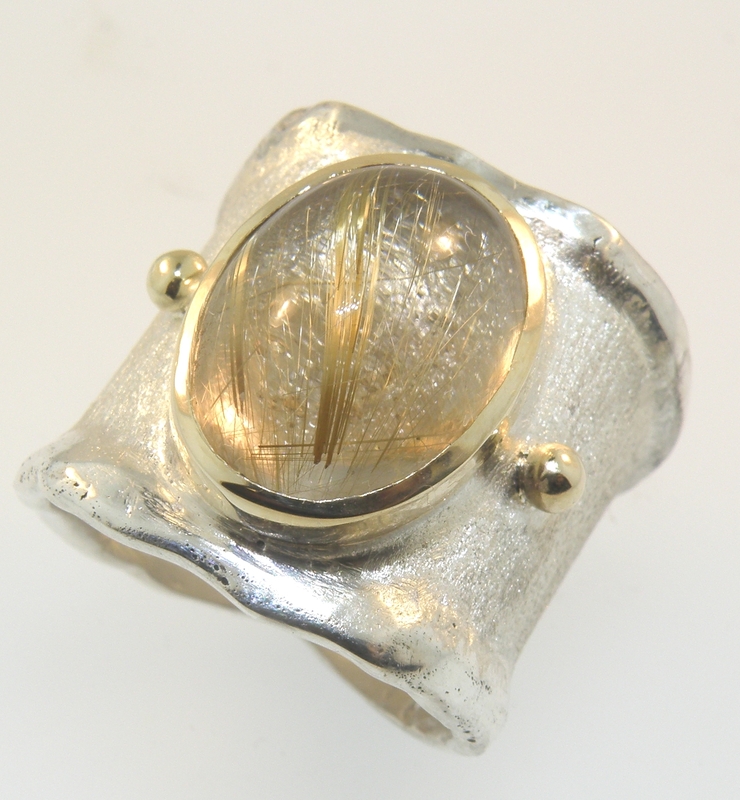 The oval rutilated quartz cabochon weighs 10 carats and is set in sterling with a 14 karat yellow gold bezel and accents. The ring is a size 8 and one of our widest, tapering from 22 mm at the top to 10mm at the shank.